Symvan Capital is an award-winning EIS & SEIS technology venture capital fund manager. Symvan invests in companies seeking to have a material impact in their industry with the potential to deliver exceptional investment returns within a realistic time frame. Symvan Capital launched its first fund almost four years ago and has since won three fund management awards and a runner-up award from the EIS Association and Growth Investor Awards. Symvan Capital was established to enable investors to access technology companies with high growth potential. Symvan’s team of experts and eminent advisors and independent Investment Committee have a breadth of experience that is rare in early stage technology investing.They range from world-leading technologists in areas such as Artificial Intelligence and Machine Learning to industry compliance experts. 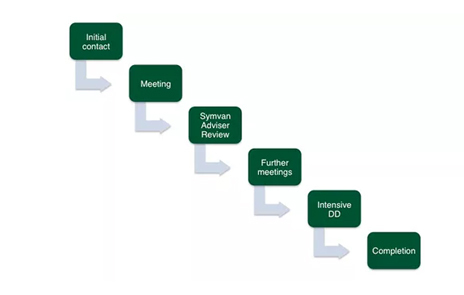 Symvan employs a Lifecycle Approach to investments. The best investment returns can be created from nurturing early-stage technologies through to and including participation in Series A fundraising rounds. The essence of the approach is that successful SEIS investments will be taken through and funded by Symvan Capital’s funds from seed start-up to venture scale-up.They aim to translate this success into strong returns for investors, maximised by charging no fees to investors except a performance fee where investments are successful. 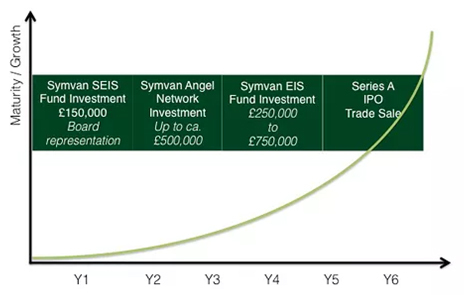 The Symvan Lifecycle Approach typically begins with Symvan Capital initially ‘seeding’ a technology business via an investment from a SEIS fund, whilst setting performance and achievement benchmarks for that company. Companies that Symvan Capital considers to be successful then become investment opportunities for Symvan’s angel investors and EIS funds, as well as for other funds and institutions, including co-investments. Symvan consider companies from a range of sources, but prefer recommendations from people who are familiar with their approach and what they look for, as well as from accelerators and incubators such as Microsoft Accelerator, TIM #WCAP Accelerator, and GSVlabs. The process of choosing Portfolio Companies is highly selective and focuses primarily on management competence. The most important investment criteria aretheir assessment of the inherent faithfulness of the executive team towards sound corporate governance practices, ability to withstand adversity, and strategic competence, while always looking for ideas and technology which has the potential to scale and create genuine impact. Even the best ideas will struggle to succeed without the right management. To this end, Symvan also takes a board seat on all its investee companies, working closely with them to steer the company towards success. Symvan have invested in companies that operate ined-tech, machine learning, HR-tech, insure-tech, gaming, internet of things & big data analytics. Symvan launches their third SEIS fund this month, providing investors with access to the next group of companies in Symvan’s pipeline which will form the latest cohort to embark on the Lifecycle process. Cognisess, an investee company of Symvan’s SEIS and EIS funds, announces that it has just signed ABInBev, the world’s largest brewer, as a customer. Intercontinental Hotel Group (IHG), the world’s largest hotel group, is already a signed customer, as are other globally recognised companies such as Uber and Volkswagen. Cognisess is demonstrably at the forefront of predictive people analytics. Symvan Capital was announced as runner-up in the 2017 Best SEIS Investment Manager category at the Growth Investor Awards 2017. Symvan Capital came a narrow second in the strongly competitive Best SEIS Investment Manager award, pipped to the post by Daedalus Partners. Symvan Capital won plaudits for its strong marketing initiatives and demonstrably successful support of investee companies. See here for further details. Symvan now has three SEIS funds which have so far made investments across fourteen companies. They source opportunities through their extensive network and from leading incubators and accelerators before subjecting them to our rigorous due diligence process. This ensures that they only select those companies they believe have the potential to become creators or disruptors of entire markets. Being this selective also allows them to dedicate meaningful time and resources to each individual company to nurture that potential. Symvan’s EIS Fund is so far comprised solely of graduates from their SEIS Funds. These top performers have made progress to become revenue generative and are now moving past product development and validation, and forward into growth. These companies continue to mature, with Series A fundraising rounds on the horizon. Because of their close relationship with each and every one of our companies, they monitor their progress and funding needs to gauge when they may become suitable for the EIS Fund, while also always being on the look out for exceptional EIS opportunities from outside our portfolio. If you are interested in further information about Symvan Capital EIS or SEIS, please contact us on on info@kuberventures.com or +44 (0) 20 7952 6685.